A wingman is a mate you bring along with you to parties or bars in the hope of "picking up" women. While the responsibility of a wingman can vary, the ultimate goal is to make the male look like he is a great catch and that the woman in question would be crazy to not fall for his charm. Despite so many hints and tips on being a wingman and scoring with the women, there is very little advice on what it means to be a good wingwoman, but The Desperettes are here to fix that. 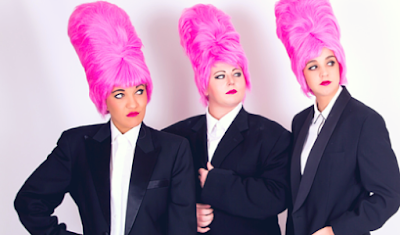 Adorned with their large pink beehives hairstyles, The Desperettes (Natasha York, Belinda Hanne Reid and Lisa Woodbrook ) are coming together for A Lady's Guide to the Art of Being a Wingman, where they highlight the double standards that women face when it comes to dating. "We started writing it because we found the idea of women using "pick-up artist" techniques hilarious, but we quickly realised that hearing women using cheesy pickup lines and talking about how they're going out with the sole purpose of getting laid is still shocking for a lot of people, and it shouldn't be. It's about empowering women, regardless of age, appearance, sexual preference etc, to embrace their sexual side and have fun," Reid tells me. "With this show, we combine masculine mannerisms and suits with the hyper-femininity of bright pink beehives and girl-group choreography to try to subvert the gender norms." "Choosing songs and scenes came down to trying to be as succinct and funny in the short time we have onstage as possible. There were a lot of scene and song ideas, and wonderful anecdotes, that ended up on the cutting room floor," she explains. "We also wanted to keep the feel of the show very modern, and so the show tends to stay away from the immense canon of traditional "girl group" songs, except for It's Raining Men. That had to be included! There are some fantastic girl harmony cabaret acts out there doing that music brilliantly already so we wanted to differentiate ourselves." The three met in 2011 at Queensland Conservatorium where they studied Musical Theatre. Since graduating in 2013 they have all ended up moving to Melbourne, performing in their own solo cabaret shows. It wasn't until June last year however, where the three got together and formed The Desperettes, debuting their show in July. "We're all very different, with different tastes in music, different ages so we've all been able to bring something different to the show. The collaborative process with two women who I love and admire was and is amazing," Reid says. The Desperettes are still coming down from a sell-out season at Perth Fringe World with their show while they prepare for their upcoming season at The Butterfly Club. "Perth loved us! It's Lisa's hometown, so we had an extremely warm reception there (and not just because it was 40 degrees plus all week!). Our audiences sold out by the end of the run, and at times we had to pause the show because the crowd was laughing so much. It was an amazing experience! Also, there was one night where our techniques worked, and one of us totally picked up a guy who came to see the show. I'm not going to say which one of us it was, but it was awesome!" "
They may have conquered Perth and have plans to do the same to Melbourne before heading over to Edinburgh to spread the word, but there is still much life (and laughs) left in A Lady's Guide to the Art of Being a Wingman. "Hopefully we will do some regional touring here in Australia next year - and we still haven't taken the show to New South Wales or South Australia," she says. "We're hoping for some on-touring opportunities to come out of Edinburgh as well BUT, there are some very exciting new ideas being bandied about at the moment - watch this space, because The Desperettes have some exciting things planned!"